Olympia stands in the western Peloponnese as a compelling reminder of past achievement, diplomacy and religious devotion since Olympia was one of the most prestigious religious sanctuaries of the ancient Greek world. The playground of the Gods and heroes of Greek mythology gave birth to and hosted the Olympic Games every four years throughout history. 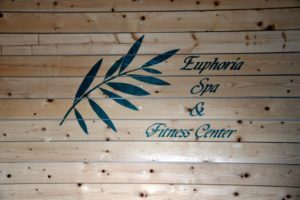 In the heart of the Greek countryside, it is blessed with its fertile land and diverse landscapes. This UNESCO Heritage Site is now the only place where the Olympic Flame is lit for each Olympiad. Don’t miss the opportunity to run the ancient track so…on your mark, get set, GO! 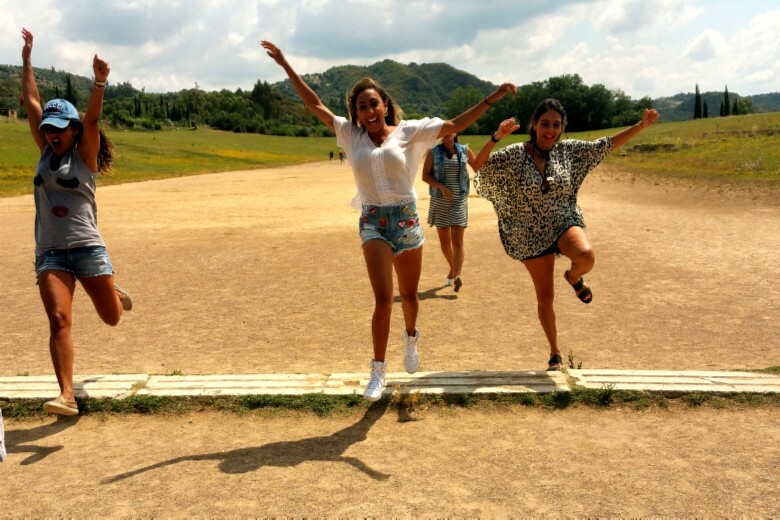 Archaeological Site of Olympia: Don’t miss out on the opportunity to run the original Olympic track. It’s a once in a lifetime opportunity! Other spots of interests are the training facilities where the athletes would warm up, the hotel for VIPs only and the place where the Olympic flame is lit twice every four years. The first recorded ancient Olympics were held in 776 BC. The sanctuary continued to function during the first years of Christian rule under Constantine the Great. The last Olympic Games were held in 393 AD, before a decree of Theodosius I prohibited all pagan festivals. 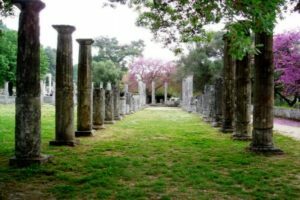 Olympia remained forgotten until 1766 when the ancient sanctuary was re-discovered. Systematic excavation began by the German Archaeological Institute in 1875 and continues to the present. Several monuments of the site are currently under conservation and restoration. 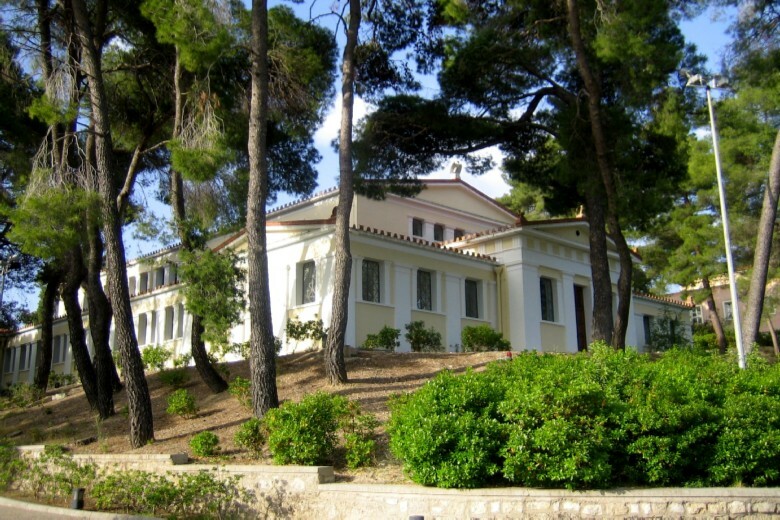 Archaeological Museum of Olympia: The museum houses the most important finds of the excavations, which began in 1875 by the German archaeologists. Its exterior resembles an ancient Palaestra, the training facility of the wrestlers. 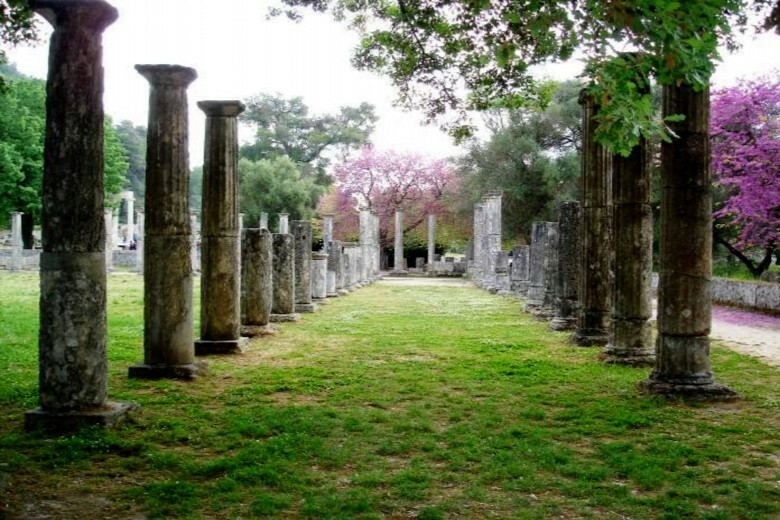 At the entrance, the model of Ancient Olympia is a must first stop in order to perceive how the site was originally. Even though the exhibition follows a chronological order, the highlights stand in the middle and at the right wing of the hall. These are: the original marble sculptures of the Zeus temple; the metopes of the temple which depict the 12 labors of Hercules; the Nike statue; the 4th century BC Statue of Hermes of Praxiteles which inspired the artists of the Renaissance with its perfect proportions. Museum of the History of the Olympic Games: Majestically crowning one of the hills in Olympia, this building has the appearance of an ancient temple. It was the first museum to host the antiquities found in the late 19th century. 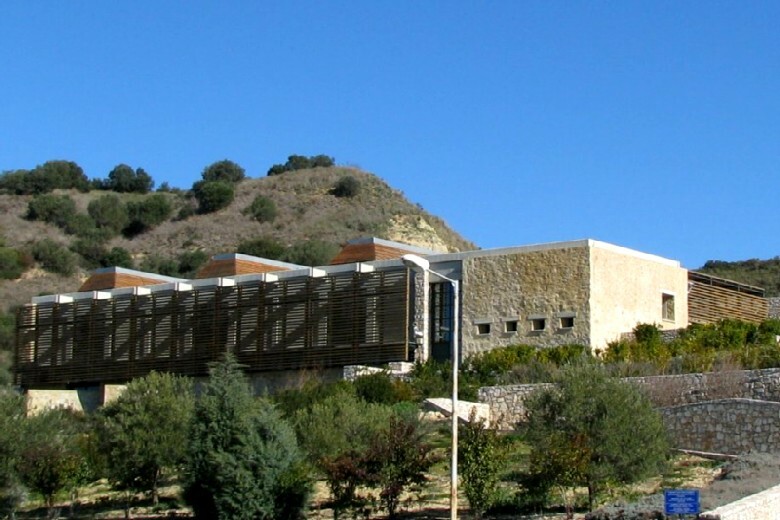 Nowadays, it supplements the main archaeological museum and is also used for educational programs. Here you will find “ancient Playmobil”, small stylized statuettes of animals which were actually the offerings of the poor people. Those who could not afford to sacrifice a real animal to Zeus could buy a little votive offering at one of the ancient souvenir stands in Olympia and dedicate it to the god. Additionally, in the main hall one may admire a mixture of ancient statues and implements representing each ancient Olympic discipline. The Archimedes’ Museum: This museum of ancient Greek technology is permanently hosted in a two-storey building in the center of the town of Olympia. The museum is of the most unique thematic museums in Greece and is dedicated to the great Mathematician, Physicist, Engineer, Astronomer and Inventor in ancient Greece and a genius of the technology of his time. Archimedes passed on great theses of all the ancient sciences and, above all, he became the springboard for the development of modern science. Some of his inventions are in use even today. 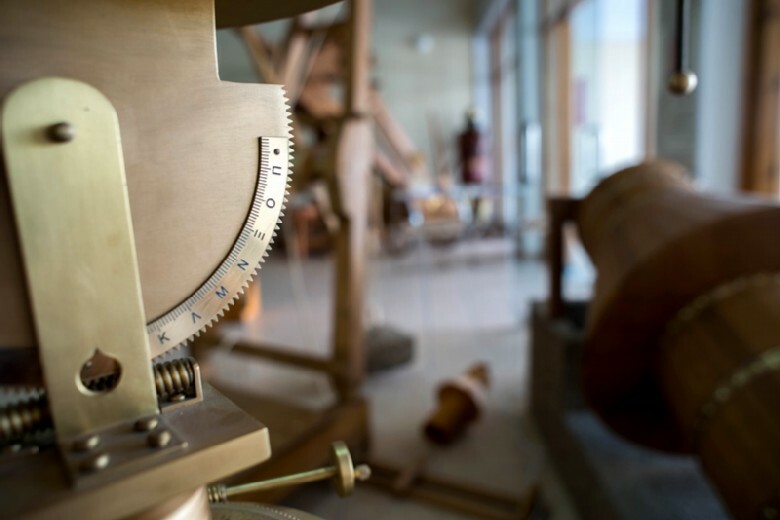 It is known that Archimedes inspired Da Vinci and even influenced Galileo and Newton. As Leibniz quoted, “He who understands Archimedes … will admire less the achievements of the foremost men of later times”. Archaeological Site of Ilida: Ancient Elis was the city which had, under its supervision, the organization of the Olympic Games and the preparation of the athletes. Two days before the Olympic Games began, a procession set out from this city-state and all the athletes and trainers had to walk the whole distance to Olympia (58 km). This procession was meant as spiritual cleansing, to prepare themselves psychologically for the religious games they were about to take part in. 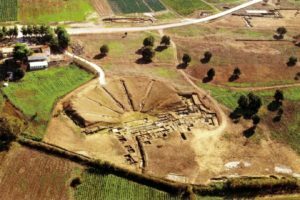 The site stands in the heart of the Eleian valley near the legendary river of Pineios, where the fifth labor of Hercules took place (Augean Stables). The remains are scattered, with the exception of the theatre which has recently been partially restored and now hosts cultural events. During the summer, people from all over the area have the opportunity to watch ancient tragedies, comedies etc. under the moonlight. There are also remains of training facilities, a marketplace (agora) and roman baths. Archaeological Museum of Ilida: The museum is situated on the slopes of the hill with a wonderful view over the valley and archaeological site. It was erected in 1981 and renovated in the early 2000. 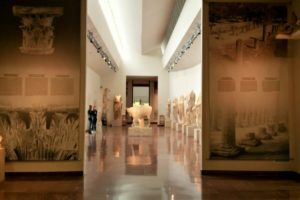 It houses a display of finds (statues, reliefs, pottery and artefacts) from the Early Helladic to the Roman period and a large number of bronze mirrors and jewelry pieces; find out that women in antiquity were just as vain as they are today! In its courtyard, one may admire the impressive sculptures and the mosaic floor depicting the labors of Hercules and the symbols of the Muses. Temple of Epikourios Apollo: Climbing up Ancient Vassae (1200m), one has the opportunity to admire the majestic temple, dedicated to Apollo Epikourios (Apollo the helper), described as the Parthenon of the Peloponnese. 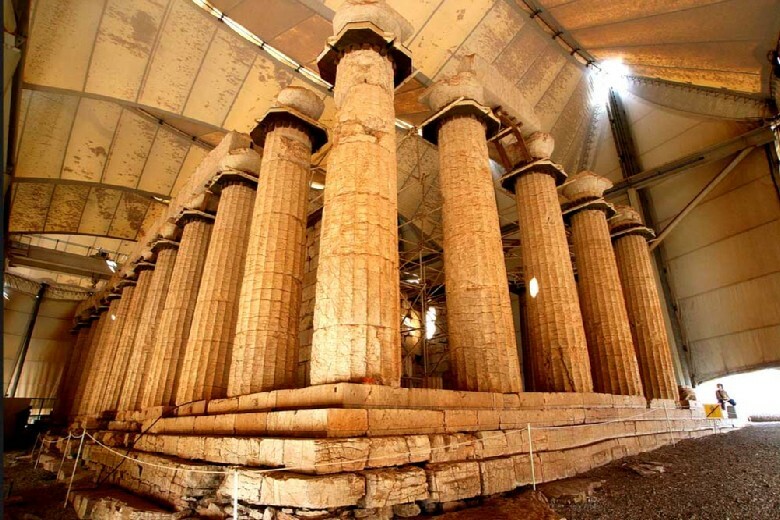 The temple of Apollo Epikourios, the god of the sun, is one of the monuments of world cultural heritage of UNESCO. Distinguished for its uniqueness, it has examples of all three of the classical orders used in ancient Greek architecture: Doric, Ionic, and Corinthian. The ancient Greek temples were not random architectural structures. They were not only constructed to house the ancient cult, but to capture the harmony of the universe, embedding the deep knowledge that connects Earth to the celestial, humans to infinity. As such, the Temple of Epikourios Apollo holds surprising secrets hidden deep within its foundations. It is the only temple in Greece that rotates around its axis like a huge compass made of stone and marble. Castle of Chlemoutsi: A beautiful medieval castle standing on the summit of a hill on the westernmost headland of the Peloponnese. 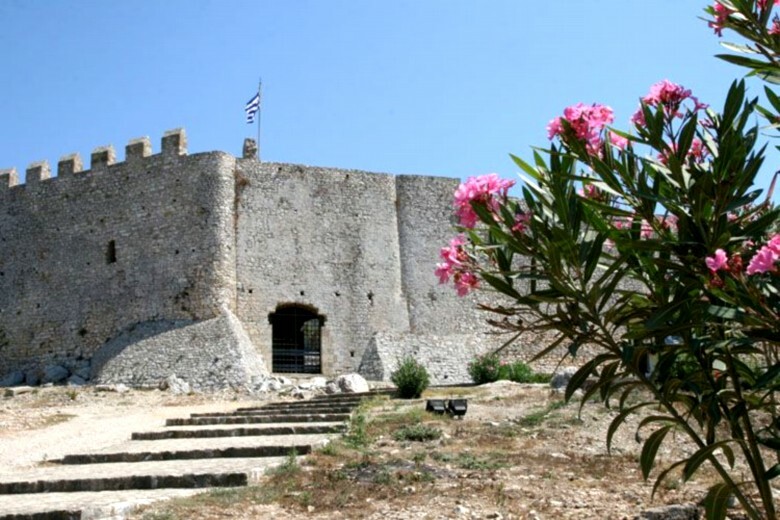 The Chlemoutsi Castle was built between 1220-1230 and was the strongest fortress in the Frankish principate of Achaia commanding the passage from West to East. It converted the area into a crossroad of different civilizations in a period less known to most. Feel the atmosphere of the medieval times as you wander around within its huge stone walls. 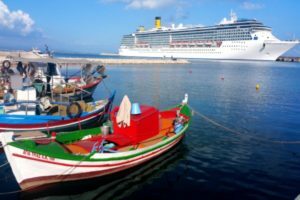 Katakolon: Katakolon is a small picturesque fishing village on the west coast of the Peloponnese, where many cruise ships anchor to visit Olympia, the birthplace of the Olympic Games. Until the end of the nineteenth century, this harbor was very important for the export of currants. 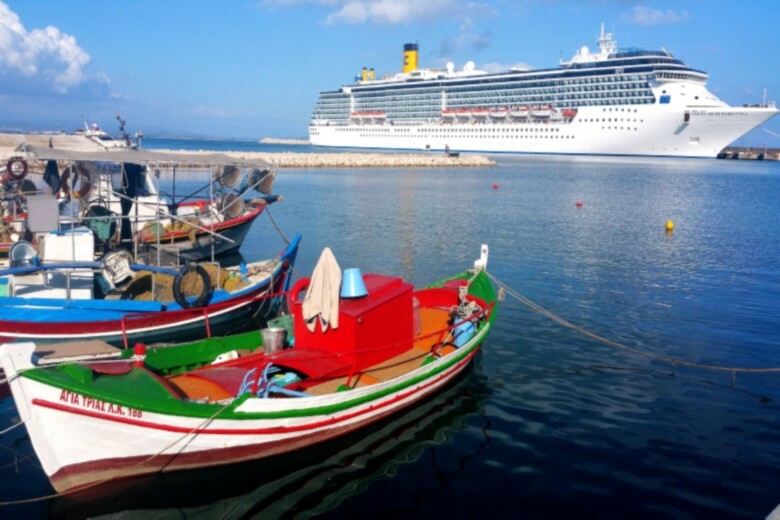 Due to its geographical position, it is also the perfect base to explore the mythical western Peloponnese and the countryside. 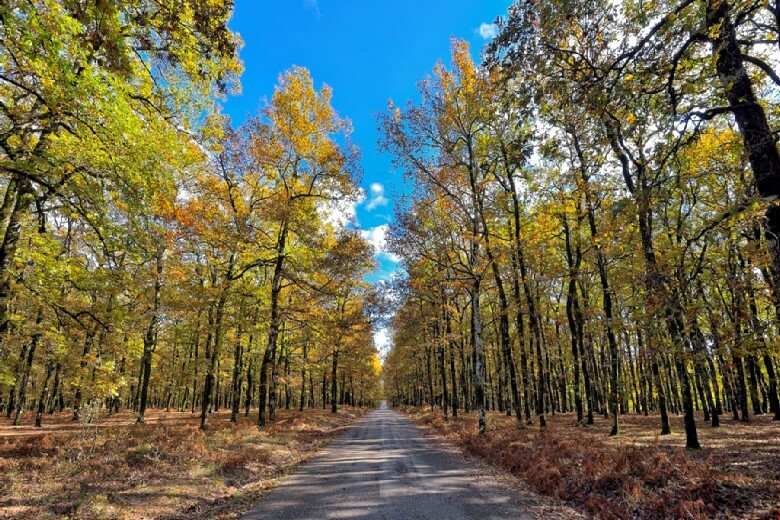 Forest of Foloi: The Foloi oak forest is situated at an altitude of 688m. It is an ecosystem unique in the Balkan peninsula. This wonderful self-sown forest of huge oaks and beeches covers an area of 40,000m2. Its name is connected with Centaur Folos, who turns up in one of the labors of Hercules. According to Greek mythology, the centaurs were half man half horse creatures, notorious for their excessive drinking and their lack of self-control in general. This characteristic went contrary to the Greek ideal – moderation in all things. However, not all centaurs were bad creatures. One of the good ones was Folos who lived in the forest near Olympia. 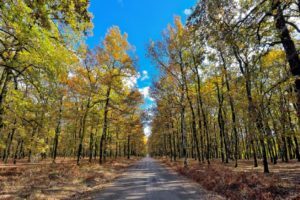 The forest has been designated the status of a protected area enlisted in the Natura 2000 ecological network of the EU. Monastery of Kremasti: The Monastery of Kremasti is located in a small village near Olympia. It is a unique destination where the visitor can find the pure taste of the Greek orthodox faith; a real glimpse of heaven! Imposing and impressive, literally hanging off the rock, one can easily see how it got its name. Standing majestically at an imposing height, its size and its architecture, it appears to be suspended from the rocky mountainside. The chatty nuns living there are always willing to share their stories with their visitors. As in other monasteries, there is a dress code here as well; for the ladies, it is appreciated if you wear a skirt and have your shoulders covered up; for the men, please no shorts or shirts without sleeves. Monastery of Skafidia: The beautiful medieval monastery of Skafidia is now actually a nunnery dedicated to the Virgin Mary. It is located in the coastal part of the area, just a 13-min drive from Katakolon Port. From the outside, this nunnery looks like a fortress. Once inside, one may wander around the open courtyard and admire the old katholikon (main church) with frescos in the narthex dating back to the 10th century AD. Apart from its remarkable architecture, it houses many treasures, such as sacred vessels, vestments, reliquaries, uniforms, weapons, photographs, coins, votive offerings including the banner of the Monastery, the image of the Virgin Mary hand sewn in fine needlework. Important is the archive of the monastery and library with many manuscripts, referring to liturgy, music, icon painting and other subjects. As in other monasteries, there is a dress code here as well; for the ladies, it is appreciated if you wear a skirt and have your shoulders covered up; for the men, please no shorts or shirts without sleeves. Neda River: Crossing the canyon of Neda, one has a unique chance to get in touch with the mysteries of Greek mythology and the treasures of nature. Neda, according to Greek mythology, was one of the nymphs to whom the mother of Zeus, Rhea, entrusted the care of her offspring. 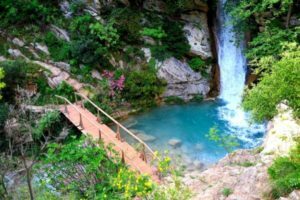 By word of mouth, nymph Neda, the only female Greek river, changed into a river and her long braids became wonderful waterfalls, that have decorated the canyon ever since. 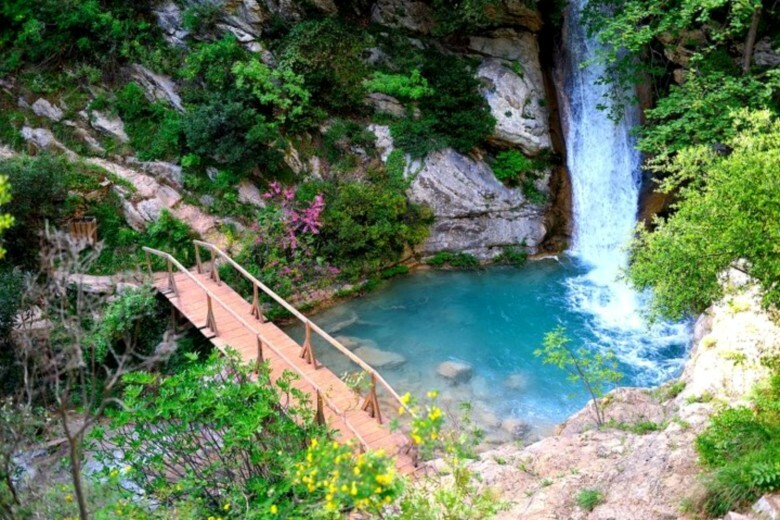 The descent towards the canyon starts from the village Figalia and links two neighboring prefectures: Messinia and Elia. 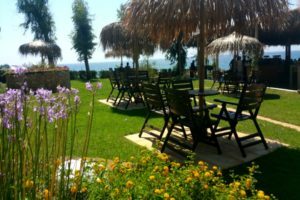 Olympia Land Winery: Olympia Land, a family-owned winery lies in the valley of the river Kladeos just 2 kilometers from the heart of Ancient Olympia. The facilities of the winery are surrounded by beautiful roses, vineyards and olive trees. 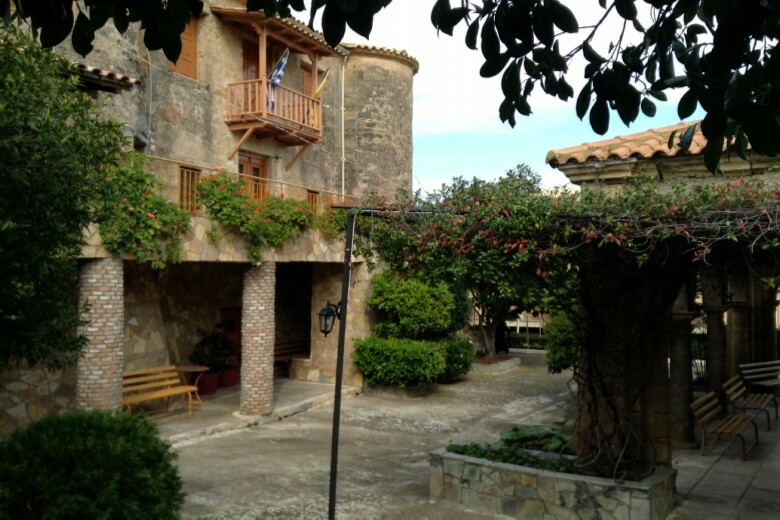 The family will welcome you walk you through the vineyards, the production area and the cellar with the oak barrels. 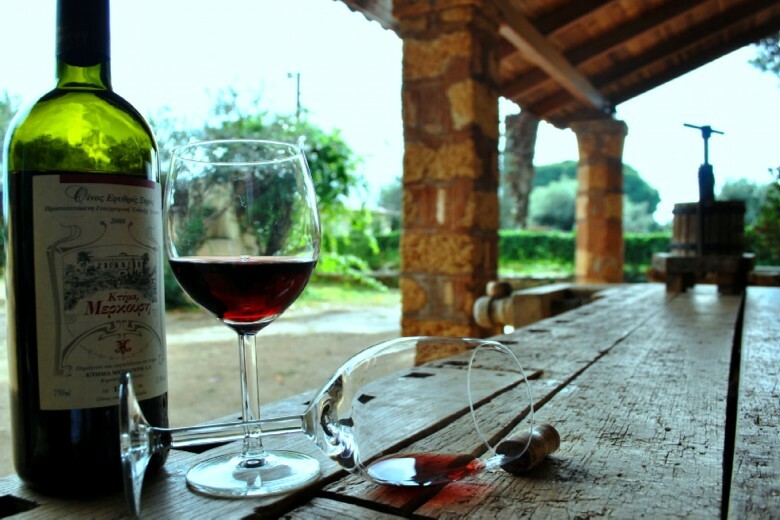 Release your senses and enjoy the wines, olive oil, olives and other delicacies in the air-conditioned reception area. Mercuri Winery: Off the beaten track, the “wine road” leads you to the Mercury Estate with its extensive history of over 150 years in the production of wine and olive oil. It belongs to the Mercouri family; a family with a variety of interests, but a particular love of the earth. One can visit not only the wine production facilities, the vineyards and olive groves of the estate, but also the small folklore museum which houses a collection of old rural tools and instruments. 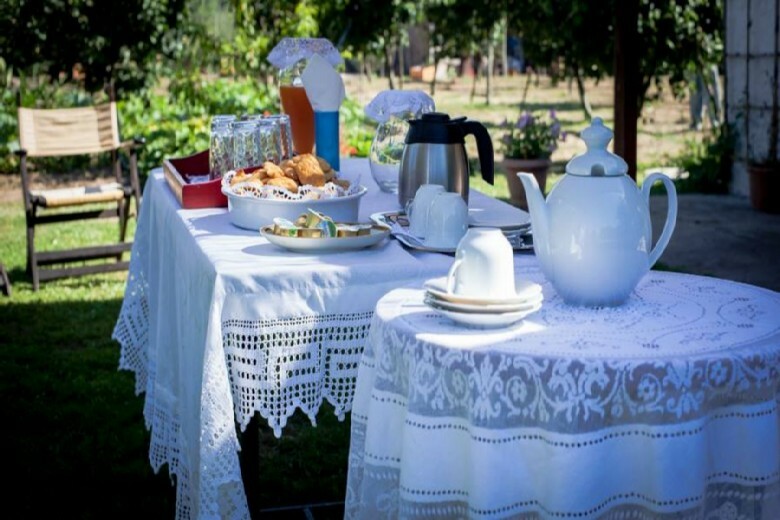 Local Farmhouse: Located only a short walk from Ancient Olympia is a typical local farmhouse. Its garden is filled with fruit trees and vegetables where visitors will discover “unknown Olympia”. 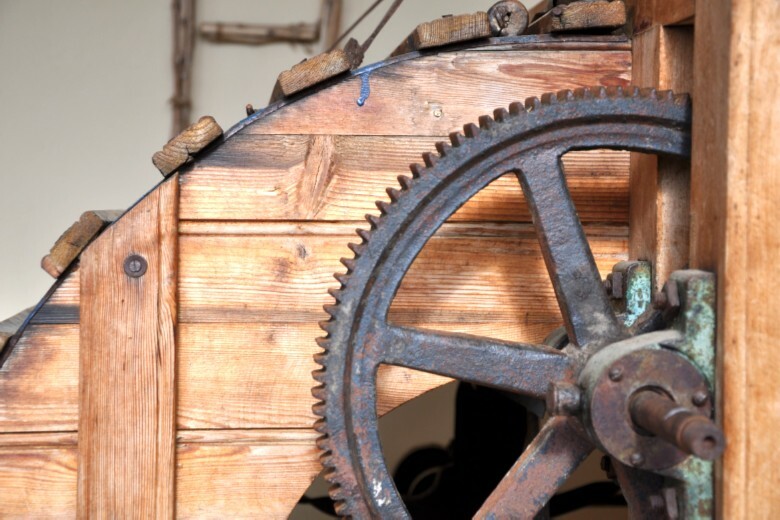 The owner, Klio, guides visitors through her collection of old and new tools used for rural activities. These are housed in a building about a hundred years old, once used for the supplementary work on the farm. Try the seasonal fruit platter accompanied by fresh juice and coffee or the homemade aperitif while Mrs Roula, her mother, prepares “diples”, a traditional sweet with honey, as she unfolds the dough and the secret recipe for this mouth-watering dessert. 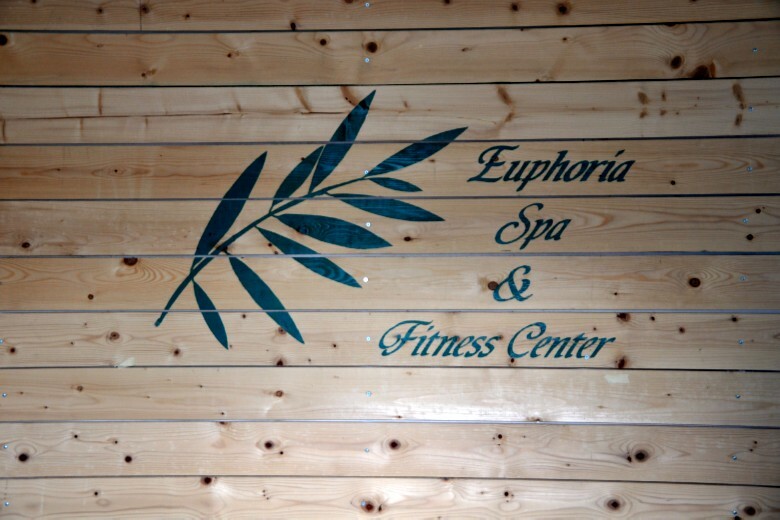 Euphoria SPA & Wellness Centre: Combine your visit in Olympia with a pampering Spa experience. A true “escape” to luxury you surely deserve. This service is offered in a nearby hotel where one may also use other facilities such as the swimming pool and bar. Agios Andreas Beach: Just a 4-minute drive from the picturesque harbor of Katakolo is the beach of Agios Andreas, with its small coves, sharp rocks, blue green waters and pine trees that come right down to the sea making it a unique landscape. This was the location of ancient Pheia, the harbor of ancient Olympia. In the past many locals found ancient coins and remains of amphorae attached to the rocks. The beach of Agios Andreas charms the visitor and especially divers, since its sea-floor has been described as magical. This beach is nice for families with young children too as the rocks in front of the beach form the boundaries of a natural swimming pool. Skafidia Beach: A 13-minute drive from Katakolon, the fine sand, shallow blue waters and the green background of the hill that rises above characterize the beach of Skafidia. This is the beach where a lot of locals and foreigners alike enjoy themselves in the morning. 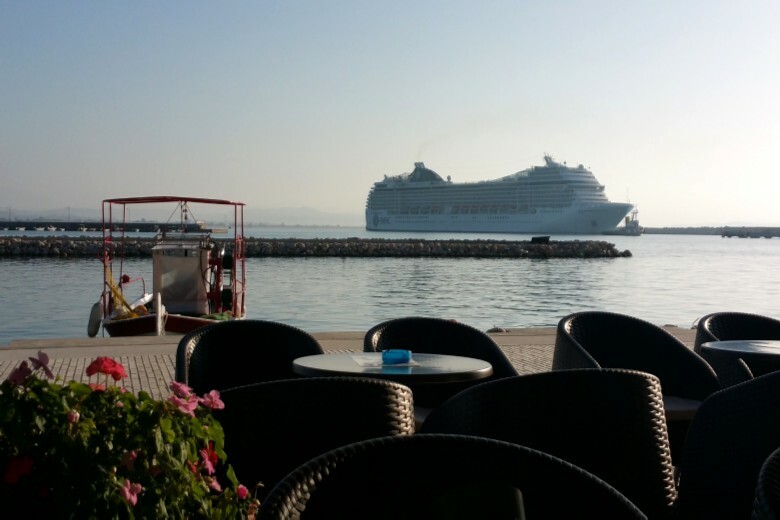 Close by, there is a bar-restaurant where you can enjoy your coffee or the local delicacies after a swim. 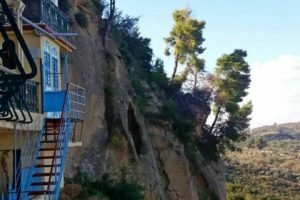 This is ideal for those who would like to avoid the crowds in Agios Andreas beach. 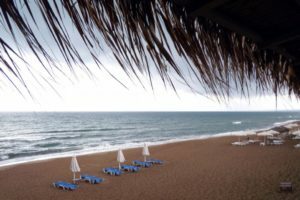 Kourouta Beach: A half-hour drive from Katakolon brings visitors to the dream seaside village of Kourouta, offering the perfect combination of endless blue, golden sand and an amazing view of the Ionian Sea. Kourouta beach is ideal for families with young children since the waters are crystal clear, thus, it has been awarded the Blue Flag, a voluntary Eco-label given to clean beaches that are also safe.